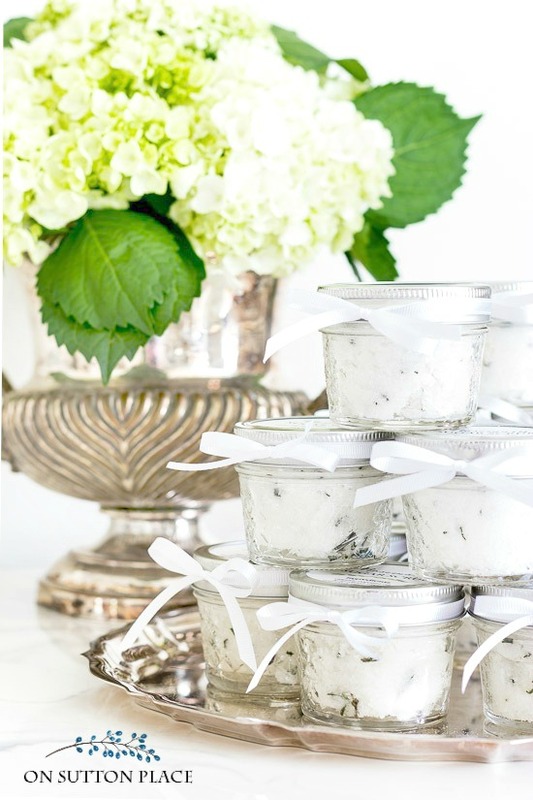 Rosemary Sugar Scrub Recipe: A DIY sugar scrub that’s the perfect baby shower favor. 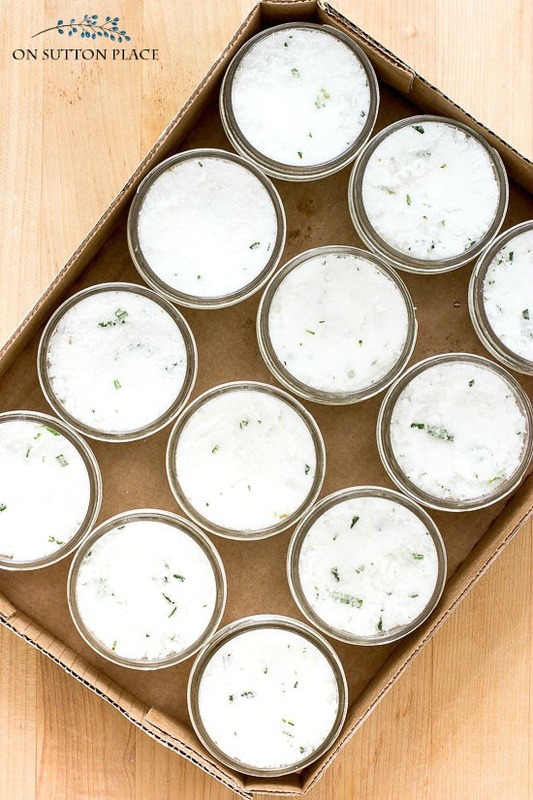 A homemade sugar scrub that uses coconut oil & rosemary essential oil. Remember when I told you I was going to be a grandmother? I can admit now that it took me a little while for it to sink in…but now that I’m used to the idea, I’m very excited. Yesterday my daughter and I hosted a baby shower for my daughter-in-law, so I’m here to share some of the details. It was a gender-neutral shower which isn’t so easy anymore! Almost everything is geared to either a boy or girl. We chose a gold and white theme which ended up being very pretty. Since I love sugar scrubs, I wanted to make something new as the favor. I decided to use fresh rosemary and when I was making the scrub, it smelled so good that I hated to cap the jars. 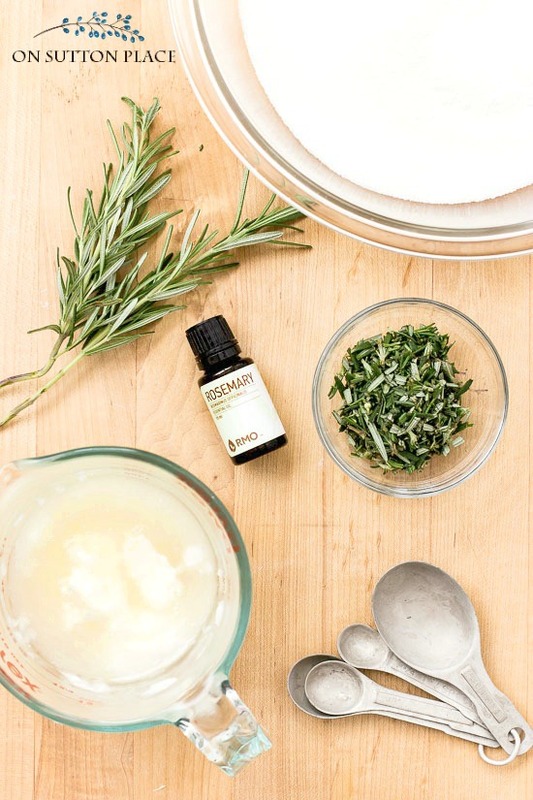 Read on to learn more about this rosemary sugar scrub recipe. Click HERE to get all the scoop on the baby shower! To soften the coconut oil, I put the whole jar (remove the lid) in the microwave for about 30 seconds. It doesn’t completely dissolve but it’s soft enough to stir into the sugar. Combine coconut oil and sugar in a large bowl. Add the rosemary essential oil and the fresh rosemary. Stir really well until it is all completely combined. I used 4 oz. mason jars and got 10 jars from this recipe. I made another half batch because I wanted one per guest plus a few extra. 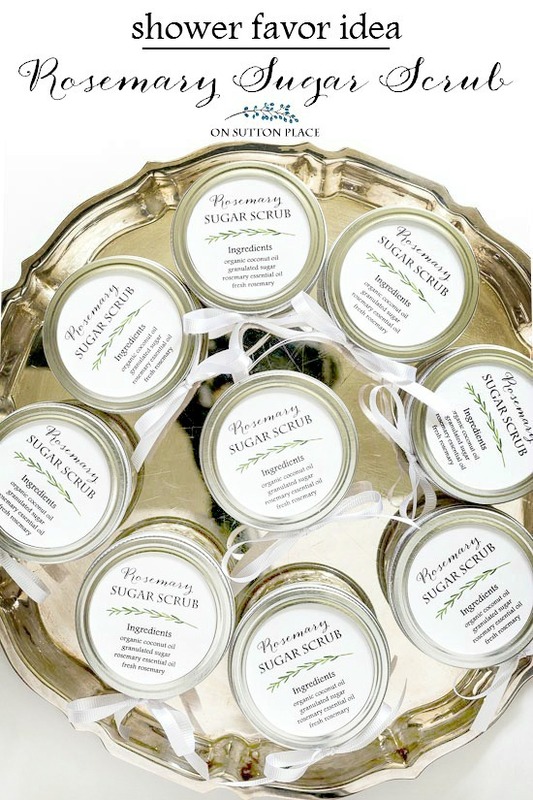 DIY sugar scrup tip: I used a large scoop to fill the jars. It was super easy and quick. The next step was some sort of tag. 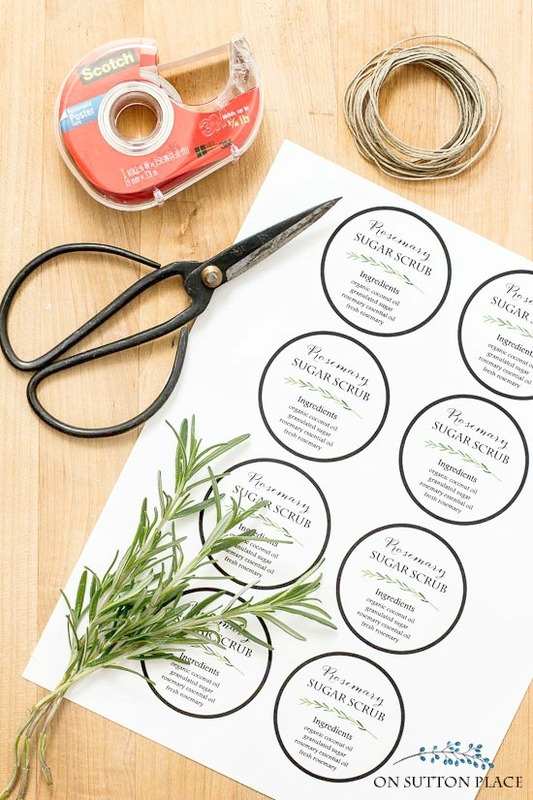 I made these homemade sugar scrub tags and the plan was to tie them on to the jars. When I had them all cut out, I discovered they fit perfectly on the jar lid! I attached them with a piece of double-sided tape and finished the jars off with a white ribbon bow. I used white cardstock to print the tags. Make sure when you print that you choose the “full page” setting. 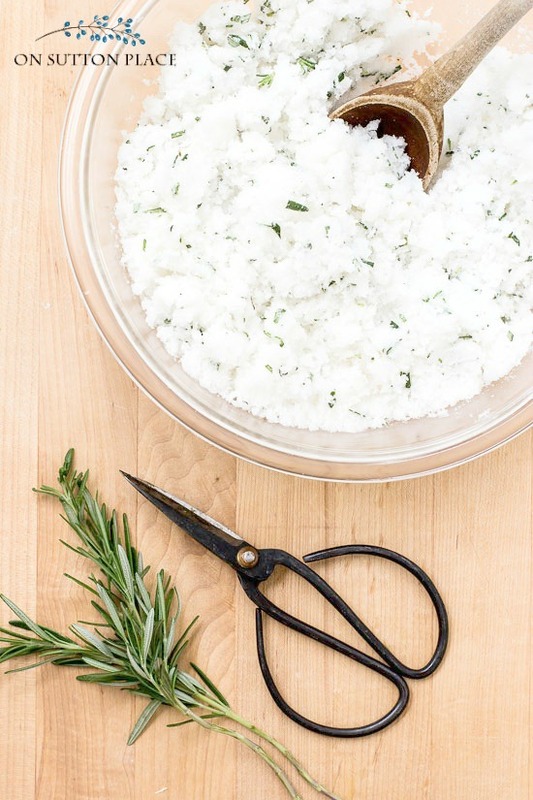 10 Ways to Use Rosemary! Ann, I love your blog, recipes, and decorating ideas but felt I had to share my experience with making rosemary scrubs as take-home treats for Thanksgiving. A week before the holiday I made them up. When I was mixing the ingredients I noticed the coconut oil scent took over the rosemary so you couldn’t smell any rosemary at all. Could be the brand I used, Spectrum, not sure. I packaged the jars anyway thinking that maybe as the ingredients melded the rosemary scent would come thru. On Thanksgiving day one of the recipients opened their jar and asked what the ‘black flakes’ were. The fresh rosemary had dried up and turned black. The scent was still coconut; the rosemary never came thru. If I make it again I will leave out the fresh rosemary all together and may increase the rosemary drops so that scent is apparent. Hi CathyAnn…I’m sorry you had issues with the scrub. The honest truth is that I, just the other day, finished a jar of the rosemary scrub and the rosemary bits were still green. So I’m not sure what happened…good idea to leave them out if you plan to make it again. I have never heard of Spectrum essential oil but there are a million brands out there. The coconut oil I use has a very faint scent and the essential oil seemed to take care of it. Definitely add as much essential oil as you want! Thanks for the reply, Ann. Spectrum was the brand of organic coconut oil I used. The rosemary essential oil was from RMO. Love this recipe. Gonna try it at home. Thanks for sharing this. 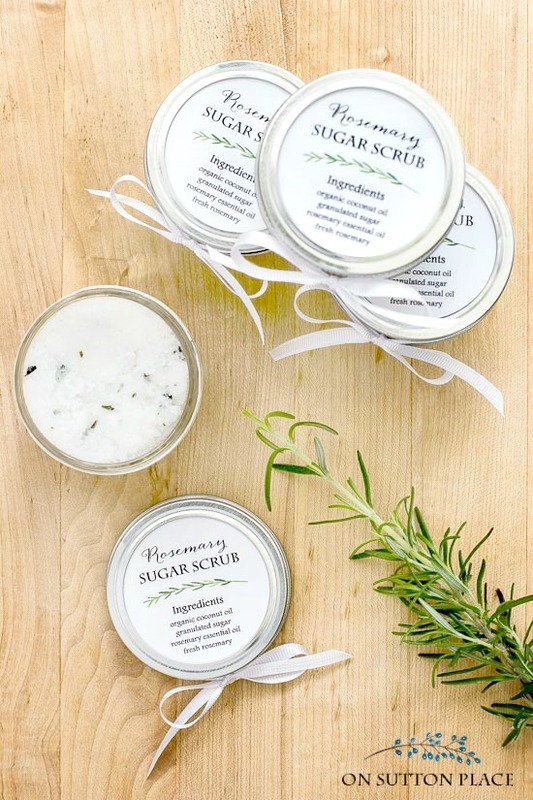 How long does the rosemary sugar scrub last and stay fragrant? My daughter’s baby shower will be in December, but I would like to make these now, since I have a lot of fresh rosemary in my garden. The scrub is so lovely! I give it as hostess gifts and birthday gifts to friends! Thank you! Ann.. Your Rosemary Sugar Scrub was simply perfect. I used it for a bridal shower I planned for my future daughter in-law and I followed your instructions exactly. They were a hit and elegant too. Thanks again for another thoughtful idea. I was wondering about the shelf life in this? Another question I have is if Rosemary helps promote hair growth, how is it going to be for a body scrub? I love the idea and sure it smells lovely. The shelf life of the scrub is between 2 and 3 months. If you are concerned about the fresh rosemary, you could use dried or leave it out all together. The rosemary essential oil, coconut oil and sugar last for a long time. Another idea is keeping the scrub in a dry place, for example not in your shower. Dampness helps mold grow. I honestly have no idea about the hair growth issue. I’ve been using it on my hands regularly for almost a month and see no difference. Hope this helps! Congratulations Ann. You will love being a grandmother from the moment that little bundle of joy is in your arms. I am thrilled for you. After he or she is born, start snapping pictures and purchase a beautiful scrapbook. We have six grandchildren and our first graduated from high school this June. Her maternal grandmother displayed three huge scrapbooks recording our granddaughter’s eighteen precious years. A fabulous keepsake. This is a GREAT party favor, Ann! And congrats on becoming a grandma! Just wait! It’s absolutely AMAZINGGGG! When is she due? 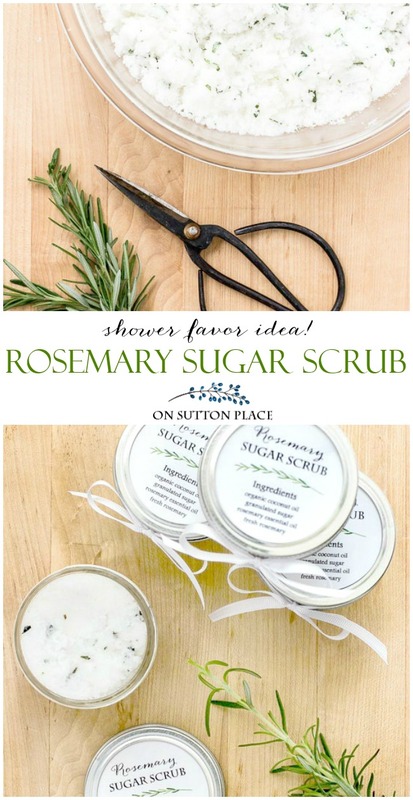 Hi Ann, Love the rosemary sugar scrub idea. My daughter is getting married and I did a similar thing only I used some cute jars I found in the Target Dollars spot and since her shower is a Kate Spade theme I went with a pineapple scented sugar scrub. I found a pineapple shaped punch and went to town utilizing Kate Spade’s signature black/white stripe along with hot pink and sparkly gold. Hope the guests love the sugar scrub as much as I enjoyed making it. Congratulations! The circle of life….such a wondrous miracle. The shower favors are perfect & the tags are so classic. These are also fun at Christmas with peppermint! This is such a nice, useful gift and a great idea. The tags are precious and I successfully printed them out. Thank you! I have two rosemary plants in my garden and this will be a wonderful way for me to use them. Congratulations to your family! I am so excited for you! You will lve being a grandmother. This scrub looks so amazing, I can’t wait to make some to share with my sisters, daughter and daughter-in-law. What a great gift idea. Ann, thanks for another great gift idea! You are so amazing! Enjoy your new little one! This precious little bundle is very fortunate to have such a wonderful Grandma! Blessings! Have a great week, Ann! Nummy as in it smells devine. Love this idea. Will tuck away for a future party. For my daughter in laws bridal shower last year my niece made lemon coconut sugar scrub. I am still hoarding a few jars – so nummy. Thanks for always having such great posts. Very inspiring. Thank you!! I can’t wait to make some. I love this idea!! We are planning my daughter’s wedding next year and I think I will be making this! Thank you for the recipe! Hi Ann – Sounds like a beautiful shower. Congrats on being a grandmother. Love the sugar scrub you made. I make it similar except I also add some almond oil. This makes it feel wonderful on your hands after you rinse it off. Hands feel so soft and waterproof. I made some at Christmas and used peppermint. Smelled good enough to eat! Thanks for sharing. More pics please. Congratulations on becoming Grandma! It’s the most wonderful thing ever! Love this idea. I especially like when you share any essential oil post. Thank you. Ann,,,, just love, love, love this idea for a shower or any kind of gift. This is the first year I planted lavender in my herb garden (because of you and your wonderful ideas and recipes) and I’m excited to try this out. i so much look forward to your posts! Hope you had a wonderful time at your shower you hosted. And congratulations on becoming a Grandmother! I cant wait to make this for my girlfriends! 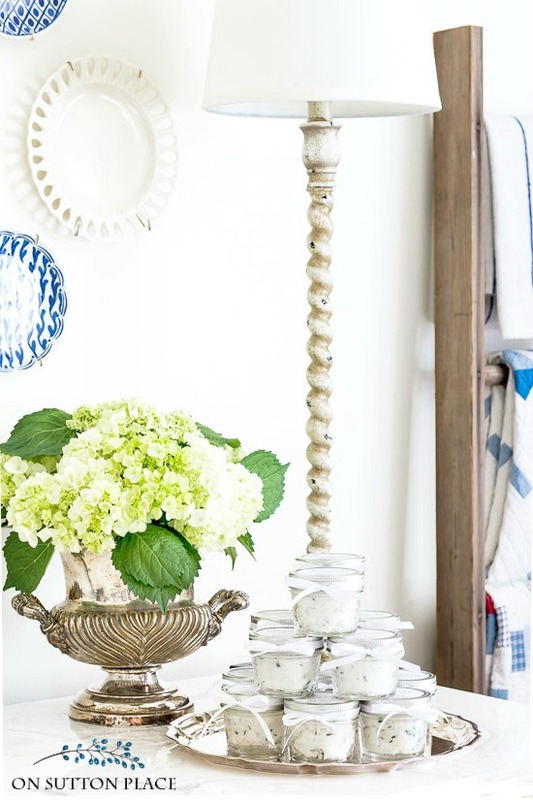 Everything you show us here is so accessible and easy, but you make it look elegant and sophisticated! You have such a talent for it. I also can’t wait to see more about the baby shower; your creativity is always inspiring ! I’m still an Aunt, not yet a Grandmother, but clearly your future holds joy and delight! These look easy to make especially since you’ve already done the tags for us. And I have fresh rosemary because I immediately bought and copied your herb garden in the galvanized pots idea. Thank you for all your wonderful ideas. Congratulations! It will be one of your best roles in life. Making memories with a child is your best contribution to a family and world. Lucky baby! I am surprised that your scrub doesn’t have Epsom Salt, but maybe that is best as a foot soak. I use it regularly in the tub. Keeps feet so soft. Now I will try your scrub for my face. Thanks for sharing. Congrats!!! On becoming a Grandma !! Grand babies are so much fun..???? Congratulations on becoming a grandmother. You will love this new chapter in your life! I am saving this for gift ideas. I’m hosting a baby shower but the mom to be wanted a tea party so the favors are going to be that “theme”. This seems more fun!! I may have to make some for me and friends though because this would smell refreshing in summer! By the way—you will love being a grand mom! A GRANDMOTHER! So happy for you! Congratulations and thank you for the scrub recipe- it will be great for my summer ‘garden hands’! Can’t wait to see more details about the shower- your ideas are the best! I was in anew shop our town last week. The owner showed me a new scrub she had just got in. I thought to myself. I could make this. Wow and you have shared your recipe this morning. Can’t wait to try. I am so excited for you to have a grandbaby. Are they nearby? I’m having a girls get together and this would make for a great little place setting. These look so pretty! Does the scrub need to be kept in the fridge due to the fresh rosemary? And, congratulations!! I’m not exactly sure but keeping it refrigerated would definitely extend the shelf life. I use it all the time so a small jar only lasts a week or so. If you do refrigerate it, take it out for a few minutes before using to soften the oil. Congratulations! Being a grandmother is a wonderful experience. Enjoy every moment. Thanks for all your great ideas. Love your Blog. What a lovely idea for a gift! Thank you for sharing. I know you are going to be a fabulous grandmother!